The career of Portuguese director Manoel de Oliveira (b. 1908) now spans more than 70 years. Oliveira made his first film, the short Douro, Faina Fluvial, in 1931, and his first feature, Aniki-Bobó, in 1942. He filmed sporadically until the 1970s, when, already in his 60s, he garnered recognition abroad and his output became more regular. Since 1990 he has made at least one film per year. In December 2002, when he released O Princípio da Incerteza (The Principle of Uncertainty), Oliveira celebrated his 94th birthday. In 2003 he will release yet another feature film, tentatively titled Filme Falado (Spoken Film) and starring Catherine Deneuve and John Malkovich. This almost certainly makes Oliveira the oldest active filmmaker in the world today. While he has long been highly respected in Europe – particularly in France and Italy – Oliveira’s recognition in the United States has been more hesitant. These differing reactions may well stem from precisely the same aspects of Oliveira’s work, which is characterised by a rather iconoclastic reflective and self-reflexive cinematic discourse that consistently goes against the grain of mainstream commercial cinema. His films are often considerably longer than the norm – almost seven hours, in the case of Le Soulier de Satin (The Satin Slipper, 1985) – and his camera is frequently static. By Hollywood standards, his films may seem slow, theatrical, or excessively talky. His themes, which range from frustrated love to questions of nationhood, from configurations of evil to divine grace, from remembrance and old age to relations between art and life, also align his work with certain more philosophical tendencies of European cinema rather than with standard American fare. Oliveira’s work represents, perhaps paradigmatically, the art-versus-money divide that has long characterised filmmaking in diverse national contexts. Almost from the beginning of his career Oliveira has expressed opposition to conventional forms of cinematic expression driven by commercial imperatives. In 1933 he published a short text titled “O Cinema e o Capital” (“Cinema and Capital”) in which he argues that the commercial organisation of American cinema has smothered and subjugated the artist. Rather than bend to commercial demands, he has followed his own artistic vision. The same goes for other heteronomous demands (1). When, for example, he released Benilde ou a Virgem-Mãe (Benilde or the Virgin-Mother) shortly before the 1974 Portuguese revolution, the film was accused of having nothing to do with the country’s contemporaneous socio-political reality. Oliveira’s response was simply that the film was set in the 1930s, not the 1970s. Critics sometimes divide Oliveira’s work into two phases: an early documentary phase that goes from Douro, Faina Fluvial to Acto da Primavera (Act of Spring, 1962), and a later phase with a primary spotlight on fiction. In reality such a view is simplistic. Oliveira has made documentaries throughout his career (see filmography), so there is no clear divide between the two modes of filmmaking. Beyond that, fiction and documentary are intertwined in many of his films, and this has to do with Oliveira’s concept of cinematic expression. In this brief essay, which does not pretend to be exhaustive, I will discuss the development of certain formal aspects of Oliveira’s concept of cinema from an early concern with cinematic specificity to a hybrid discourse that posits a very tenuous line between film and theatre on the one hand, and between fiction and documentary on the other. The shift in his concept of cinematic discourse takes place to a large extent through his dialogue with literary and theatrical texts and performances, starting primarily with his filming, in Acto da Primavera, of a popular religious drama. Of Oliveira’s 22 features, 18 are based on or directly inspired by literary works. Of these, seven derive from works of drama, and 11 from diverse kinds of narrative, ranging from novels and short stories to sermons and the Bible (2). Oliveira is most closely associated with three Portuguese writers – Camilo Castelo Branco (1862–1890), José Régio (1899–1969), and Agustina Bessa-Luís (1922–) – but his filmography also includes versions of works by Paul Claudel, Mme. de Lafayette, the Jesuit priest António Vieira, and Samuel Beckett, among others. All of his films, however, include significant literary references and allusions. The screenplay of A Divina Comédia (The Divine Comedy, 1991), for example, includes passages from the Bible, José Régio, Dostoyevsky, and Nietzsche, although it is not an adaptation of any of these (and much less of Dante). Je rentre à la maison (I’m Going Home, 2000) includes a staging of a scene from Ionesco’s Le roi se meurt (“Exit the King”), another from Shakespeare’s The Tempest, and a fictitious filming of Joyce’s Ulysses. While such references may occupy less space or be more understated in other films, they permeate his entire body of work. To fully understand Oliveira, therefore, it would be necessary to consider both his position in the Portuguese and European fields of cinematic production as well as his relations to the literary field, for they shape the very concept of cinema that Oliveira has developed throughout his career. 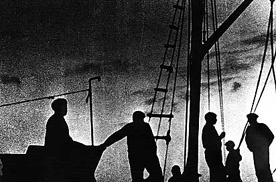 Oliveira’s first film, the 21-minute Douro, Faina Fluvial (“Labor on the Douro”), made at the moment of transition between silent and sound cinema, deals with diverse work-related activities taking place in and alongside the Douro River in Oliveira’s native city Porto, in northern Portugal. Douro is not, however, a traditional documentary about the river and the city – it is much closer to the work of Walter Ruttmann, Dziga Vertov and the early Joris Ivens. Antoine de Baecque characterises the film as a “visual symphony”, and José de Matos-Cruz has referred to it as a “geographical mosaic” in which the director brings together a multiplicity of images – often shot from strikingly unusual angles or reflected in the water – of people, boats, trains, barges, bridges, houses, alleyways, ships, light and shadows, crashing waves, objects blowing in the wind and, above all, the river (de Baecque and Parsi, 12; Matos-Cruz 1996, 73). According to the director, Douro was inspired by an image he had seen in another film: the taut chain of an anchored boat resisting the strong currents of a river. The image’s power and beauty reminded him of the banks of the Douro, with its intense activity of boats arriving and departing, loading and unloading merchandise (“Manoel de Oliveira: Entrevista,” 67). Oliveira apparently had little interest in documentary until he saw Ruttmann’s Berlin: Die Sinfonie der Großstadt (Berlin: Symphony of a Great City, 1927), which he has referred to as “the most useful lesson in film technique” that he had ever seen. At the same time, he found Ruttmann’s film rather cold and mechanical, lacking in a humanity that later films by the German director possessed. It was the humanity that existed along the Douro that Oliveira was interested in revealing (68; de Baecque and Parsi, 95). In an extensive interview granted to Antoine de Baecque and Jacques Parsi, Manoel de Oliveira refers to Douro as an experiment with cinematic specificity, the multiplicity of perspectives, and with the montage theories that were circulating at the time (96). The film is an exercise in light, shadows, rhythm, and changing camera-angles, evoking the urban transformations provoked by the inexorable process of modernisation. The key dramatic sequence, in which an ox-cart knocks a man down, is provoked when the driver of a car, distracted by an airplane flying overhead, backs into the cart, causing the ox to panic. This sequence, one of several fictional moments in the documentary, offers an early indication of the kind of cinematic hybridity that would later characterise much of Oliveira’s work. During the next 30 years, Manoel de Oliveira made only one feature-length film, Aniki-Bobó (1942) based loosely on João Rodrigues de Freitas’s poem “Meninos Milionários”. His production was otherwise limited to documentaries on a number of different topics: the opening of an electrical generating plant; the production of automobiles in Portuguese; the process of making bread; the painting of António Cruz set against the backdrop of the city of Porto; a small town, Famalicão, in northern Portugal. During the period, he also wrote a number of screenplays for which he was unable to obtain production financing (3). After three decades of sporadic cinematic activity, Oliveira returned to the centre of Portugal’s film scene in the 1960s with Acto da Primavera (filmed in 1961–62, released in 1963), a film that marks a significant change in the director’s trajectory and that initiates some of the cinematic strategies that he would develop more fully in later films. In Acto da Primavera, Oliveira films a version of a popular representation, enacted by members of a rural community in northern Portugal, of the Passion of Christ, derived from the 16th-century Auto da Paixão, by Francisco Vaz de Guimarães. Oliveira had come across the drama in the small town of Curalha when he was looking for locations for his 1959 documentary, O Pão (Bread), and he was so taken by it that he wanted to return and register it on film. Acto is a remarkable film in a number of ways. Oliveira did not simply record the popular drama as it took place, but rather re-enacted it in the same locale and with the same non-professional actors as its “real” representation. In this sense it is a re-presentation of a representation. But it goes far beyond that. The film offers scenes of the townspeople/actors preparing for their roles, shots of flyers announcing the spectacle, and other aspects of the town’s daily life. It also inserts additional fictional elements into the narrative, as when a family of middle-class tourists stops by to gawk condescendingly at the rural people engaged in their religious re-enactment. Oliveira also turns the camera on himself and his small crew as they prepare to film. Acto is neither fiction nor documentary; rather, it is both at the same time. As critic José Manuel Costa has written, the film’s “modernity is not in the creation of a space between ‘documentary’ and ‘fiction’ – as was to a certain extent the case of [Jean] Rouch’s ‘improvised’ or ‘spontaneous’ fictions – but rather in the exact opposite: the deliberate choice of the extremes of these two areas, constructing its essence in the juxtaposition of two irreducible zones…” (204). The fictional and the documentary do not simply intertwine, as they do to a limited extent in Douro, Faina Fluvial, they are juxtaposed. By the same token, Acto offers a juxtaposition of cinematic and theatrical forms of representation. José Manuel Costa notes that, after sequences in the town, a surprising shift in which Jesus appears to a Samaritan, a return to the local setting, and the gathering of the spectators, which leads one to believe that the spectacle is about to begin, the film cuts not to a stage, but rather to Oliveira and his camera, “the object that will create the second fictitious space, which is a cinematic space” (204). The focus here – without getting into the important religious or political issues that the film explores – is simultaneously on the represented and the representation, the signified and the signifier. This self-reflexive concern with modes of representation constitutes a major strand in Oliveira’s oeuvre and a central element in his concept of the cinema. After a nine-year hiatus during which he made several shorts and documentaries, Oliveira released his third feature, O Passado e o Presente (The Past and the Present, 1971), based on a play by Vicente Sanches. With it he initiated what would come to be called his “tetralogy of frustrated love”, comprising, in addition to the 1971 film, Benilde ou a Virgem-Mãe (1974), based on a 1947 play by José Régio, Amor de Perdição (Doomed Love, 1978), drawn from Camilo Castelo Branco’s homonymous 1862 romantic novel, and Francisca (1981), an adaptation of Agustina Bessa-Luís’s novel Fanny Owen (1979). It is with this tetralogy – and particularly its last two films – that Oliveira began to develop his concept of cinema with greater force, a concept that would reach its paroxysm in his filming of Claudel’s Le Soulier de Satin in 1985.
it is not possible to establish a cinematic equivalent to a literary text. But… just as one can film a landscape, one can film a text. Film it or film the voice that reads it. If I show a page from a book so that the spectator can read it on the screen, I am making cinema, and if I introduce someone who reads the text, I am also making cinema. Finally, if I use a narrative voice-over, I am still making cinema, and I am saving time (Baecque and Parsi, 53). an extremely constraining and reductive conception of cinema that thinks that it is necessary to use pans or make the camera move in and out and that language belongs more to the theatre. No, the cinema is everything. Language is a precious element of cinema because it is a privileged element of mankind (Baecque and Parsi, 70). In this sense, Oliveira has much in common with such cineastes as Rohmer, Godard, Straub and Huillet, and Duras. Second, in Oliveira’s films the line between cinema and theatre, on the one hand, and between fiction and documentary, on the other, is extremely tenuous. For him, the theatre represents the synthesis of all of the arts, with the cinema in second place. When one films something, particularly something involving actors, it is always and inevitably a staging, a form of theatre. And a film is also always a documentary, at the very least in the sense that it documents what is in front of the camera when one films. In this sense, a fictional film represents a documentary about the fiction (Cruchinho, 8). These characteristics are articulated in the films of Manoel de Oliveira in diverse ways, but particularly through a number of formal traits that run through a large part of his work: literalness of adaptation, an explicitly theatrical mise en scène, emphasis on spoken language, self-reflexivity, and the mixture of diverse genres and modes of cinematic discourse. In his cinematic versions of plays, Oliveira normally uses the original text as written, with very few if any modifications. But in his adaptation of the novel Amor de Perdição, one also notes a strong tendency toward literalness, in at least two senses. First, respecting Camilo Castelo Branco’s narrative, Oliveira films practically all of the novel’s key episodes, limiting the kind of narrative condensation that normally occurs in the process of adaptation. One result is the stretching of the film’s duration to four hours and 22 minutes. The same holds for a somewhat lesser extent in Francisca, although here Oliveira makes extensive use of intertitles to locate and in some cases synthesise the characters’ actions. This tendency reaches an extreme in Oliveira’s version of Le Soulier de Satin, which lasts six hours and 40 minutes. The second aspect of literalness in these films is the fact that Oliveira tends to use almost exclusively the words of the original work in the construction of the screenplay, both in dialogues and in voice-over narrations. Amor de Perdição has two narrators, one masculine, identified in the credits as “O Delator” (The Informer), another feminine, named “A Providência” (The Voice of Providence), besides the voices of the major characters. At times narration is redundant in relation to the image, at others it is discontinuous, leading or trailing the image or providing information that seemingly has nothing to do with the image. At other times again the narration assumes an ironic function in relation to the image. Characters engage in dialogue or at times think aloud, almost always using the words from the source-text in question. Many of Oliveira’s films – even those that are not based on theatrical works – explicitly assume a high degree of theatricality in the mise-en-scène, the use of the camera, and the acting style or the mode of representation. Scenarios are often explicitly theatrical, with painted backdrops – not unlike Rohmer’s L’Anglaise et le Duc (2001), but without the digital effects. The composition of the frame is meticulous, with actors who frequently assume a frontal position in relation to the camera and, therefore, in relation to the screen and the spectator. Oliveira’s takes are often long, and the camera is frequently static. In films like Amor de Perdição and Francisca, even characters who are engaged in a dialogue often stand or sit looking at the camera, not at each other. One often has the impressions that actors say, but do not interpret, their character’s lines. The objective of this, I believe, is precisely to deflect the spectator’s attention from the image to the words spoken, which, as indicated above, are so important in Oliveira’s films. Since Acto da Primavera (1963), Manoel de Oliveira’s films have been characterised by a strong self-reflexivity, emphasising the artificiality – or, better, the reality – of the cinematic process. The self-reflexivity may take the form of actors addressing the camera, of the visual presence of the filmmaker or of a foregrounding of the filmmaking apparatus and the process of production. To give but one of many possible examples, Benilde ou a Virgem-Mãe begins with a travelling shot backstage on the set in Lisbon’s Tobis Studios, before the camera penetrates the set per se, where the narrative unfolds in a highly theatrical filmic discourse. Through this technique, the cinema invades and in a sense becomes the theatre, or, as João Bénard da Costa puts it, the film travels from the cinema to the theatre. The film, based on a play by José Régio, is divided into three acts through the use of inter-titles, and it follows the dialogue to the letter. At the end, however, the initial journey from cinema to theatre is reversed through an astounding upward crane shot that reveals the set surrounded by the sound stage (João Bénard da Costa, 398). 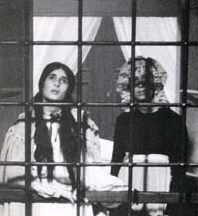 Benilde e a Virgem-Mãe reveals Manoel de Oliveira’s frequent transit along the tenuous line between film and theatre (as do such films as Amor de Perdição, Francisca, Le Soulier de Satin, Mon Cas, and Je rentre à la maison, among others). In others, it is the line between fiction and documentary that is tenuous. Here again, one example will have to suffice. In 1992 Oliveira made O Dia do Desespero, which deals with the last days and suicide of Romantic novelist Camilo Castelo Branco and is based largely on the writer’s letters. Most of it was filmed in the house where Castelo Branco in fact committed suicide. The film opens, midway through the credits, with a 50-second static shot of a pen-and-ink portrait of the writer. Other portraits, always shot with a static camera, punctuate the film’s narrative, lending it a documentary tone from the outset. After the credits, the camera focuses on a block of paper on a desk. 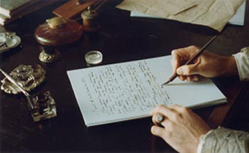 A man’s hands come into view and he begins to write. The shot is interrupted by an intertitle that briefly explains Castelo Branco’s relationship with his daughter. There follows a four and a half minute high-angle shot of a carriage wheel rolling along a dirt road, while a male voiceover narration reads a letter the novelist had written to his daughter. The camera again is static, and yet the shot is not motionless because of the movement of the wheel, light and shadows, and the rhythm of the narrator’s voice. After several more shots – of the carriage moving along the road, of the sky, and of the house, which is apparently the carriage’s destination (apparently, because Oliveira does not show the carriage arriving) – the camera finally focuses on a man seated at a desk by a window. The spectator might expect, at this point, that the “story” will now begin. However, the man seated at the desk stands up, faces the camera, and introduces himself as the actor Mário Barroso, who will be playing the role of Camilo Castelo Branco (and who played Castelo Branco in the earlier Francisca), and offers information about the writer. A bit later in the film, Ana Madruga, the actress who plays Castelo Branco’s companion Ana Plácido, does the same thing, at the same time briefly serving as a “guide” to the Castelo Branco museum where the film was shot. Despite the existence of these ostensibly “documentary” elements – the house, the portraits, the actors presenting themselves as such – O Dia de Desespero, Oliveira insists, is a fiction film, but it is one that refuses to deceive the spectator (in Baecque and Parsi, 56) by pretending to be what it is not. In O Dia de Desespero and other films, Manoel de Oliveira questions the ontological status of such terms as “fiction” and “documentary” and challenges, through the pursuit of his own cinematic vision, some of the filmic and narrative conventions that have come to dominate mainstream commercial cinema. His films also challenge the spectator to think about, rather than passively accept, that which is shown on the screen. Antoine Baecque and Jacques Parsi, Conversas com Manoel de Oliveira, tr. Henrique Cunha. Porto, Campos das Letras, 1999. João Bénard da Costa, Benilde ou a Virgem Mãe/1975, Textos CP, Pasta 59, Cinemateca Portuguesa, Lisbon, 15 December 1998, 397-398. José Manuel Costa, “Acto da Primavera (1963),” Textos CP, Pasta 39, Cinemateca Portuguesa, 21 November 1988, 203-205. Fausto Cruchinho, “Manoel de Oliveira ou Manuel de Oliveira?” onferência proferida por FC, Auditório do Centro de Juventude, Faro, 27 April 1995. “Manoel de Oliveira: Entrevista,” in Olhares sobre Portugal: Cinema e Antropologia, Lisboa: Centro de Estudos de Antropologia Social do ISCTE e ABC Cine-Clube, n.d. Interview reprinted from Film 57, December 1963. Randal Johnson, “Pierre Bourdieu on Art, Literature and Culture.” in Pierre Bourdieu, The Field of Cultural Production: Essays on Art and Literature, ed. Randal Johnson, Cambridge, Polity Press, 1993, 1-25. José de Matos-Cruz, Manoel de Oliveira e a Montra das Tentações, Sociedade Portuguesa de Autores – Publicações Dom Quixote, Lisbon, 1996. Manoel de Oliveira, Alguns projectos não realizados e outros textos, Cinemateca Portuguesa, Lisbon, 1988. Manoel de Oliveira, “O Cinema e o Capital.” Movimento, no. 7 (1 October 1933). Reprinted in O Cinema de Manoel de Oliveira,Vértice, Coimbra, 1964, pp 50-52. Aniki-Bobó (1942), 35mm, 70 min. 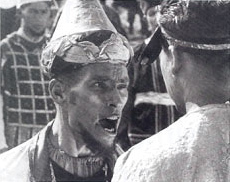 Acto da Primavera (1962), 35mm, 90 min. Passado e o Presente (1971) 35mm, 117 min. Benilde ou a Virgem-Mãe (1974), 35mm, 106 min. Amor de Perdição – Memórias de uma Familia (1978), 16mm, 262 min. Francisca (1981), 35mm, 167 min. Le Soulier de Satin (1985), 35mm, 400 min. Mon Cas (1986), 35mm, 88 min. Os Canibais (1988), 35mm, 99 min. Non ou a Vã Glória de Mandar (1990), 35mm, 111 min. A Divina Comédia (1991), 35mm, 141 min. Dia do Desespero / Le Jour du Desespoir (1992), 35mm, 75 min. Vale Abraão (1993), 35mm, 187 min. A Caixa (1994), 35mm, 93 min. Convento (1995), 35mm, 91 min. Party (1996), 35mm, 91 min. Viagem ao Princípio do Mundo (1997), 35mm, 95 min. Inquietude (1998), 35mm, 114 min. A Carta/La Lettre (1999), 35mm, 100 min. Palavra e Utopia (2000), 35mm, 132 min. Vou para Casa/Je Rentre à la Maison (2001), 35mm, 90 min. Princípio da Incerteza, Jóia da Família (2002), 35mm, 90 min. Douro, Faina Fluvial (1931), 35mm, 21 min. Estátuas de Lisboa (1932), 35 mm, 8 min. Hulha Branca, Empresa Hidro-Eléctrica do Rio Ave (1932), 35 mm, 7 min. Miramar, Praia das Rosas (1938), 35mm, 9 min. Portugal Já Faz Automóveis (1938), 35mm, 9 min. Famalicão (1940), 35mm, 24 min. O Pintor e a Cidade (1956), 35mm, 28 min. O Pão (1959), 35mm, 59 min. A Caça (1963), 35mm, 20 min. Villa Verdinho – Uma Aldeia Transmontana (1964), 16mm, 18 min. As Pinturas do meu Irmão Júlio (1965), 16mm, 16 min. Visita ou Memórias e Confissões (1982), 35mm, 68 min [to be screened publicly only after director’s death]. Lisboa Cultural/Lisbonne Culturelle (1983), 16mm, 58 min. Nice – A Propos de Jean Vigo (1983), 16mm, 58 min. Simpósio Internacional de Escultura em Pedra – Porto 1985 (1985),16mm, 60 min. A Propósito da Bandeira Nacional (1987), 16mm, 7 min. En une Poignée de Mains Amies (1996), 16mm, 25 min. Porto da Minha Infancia (2001), 35mm, 62 min. The term “heteronomous” is used according to the sense given to it by sociologist Pierre Bourdieu. It refers to a principle of legitimation that is external to the specific interests of the field of production in question. In contrast, specific interests are subject to what Bourdieu calls an “autonomous” principle of hierarchisation or legitimation. For a discussion of these concepts, see Johnson. These numbers depend on how one counts. I have included among the films based on works of drama Mon Cas and Inquietude, which actually derive from more than one genre. The former is based on plays by José Régio and Beckett as well as the biblical Book of Job, the latter on a play by Prista Monteiro and narratives by António Patrício and Agustina Bessa-Luís. Financing in Portugal, which was ruled by a dictatorship from 1926 until 1974, depends largely on government concessions. Those in favour with the regime were more likely to receive financing than those who were not. The screenplays have been published in Alguns projectos não realizados e outros textos. The film Famalicão (1940) is the first film by Oliveira that mentions romantic writer Camilo Castelo Branco (1826-1890), who lived and ultimately committed suicide in the town. Castelo Branco is the author of Amor de Perdição (Doomed Love, 1862), which Oliveira would film in 1978, and he is a character in Francisca (1981). Oliveira’s O Dia do Desespero (Day of Despair) deals with the final days of the author’s life.